The English telescope mount was a very large Victorian design which was installed in very large observatories. The RA shaft was very long, many feet long, and it was supported by two piers. The south pier was very short and supported the South bearing. The North pier was very tall and on the other side of the observatory and supported the North bearing. We have taken the English Mount and shrunk the design and kept the load bearing strength by bringing the piers together and supporting the piers together into a “C” shaped bracket on one pier. This design allows the weight of the telescope to be supported evenly between the bearings. This along with oversized bearings and shafts means that any chance of flexing is greatly reduced. One of the key points of this design the the modified Dec housing. We have made it possible to pass the Dec shaft through the RA shaft of the same size. This allows RA shaft on be long and also be held rock steady between the two sets of bearings. This also allows a long Dec shaft, which is unusual on an English Mount. 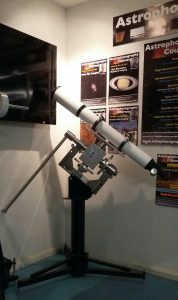 The design is “portable” as we have taken the English Mount and shrunk the design and made it portable so that it can be easily installed in any observatory any where in the world. Looking at the different problems of the multitude of different telescope mounts, we have stripped concept of telescope mount back to its core components. We have calculated the forces involved and though innovation our aim is to produce the best telescope mount on the market. 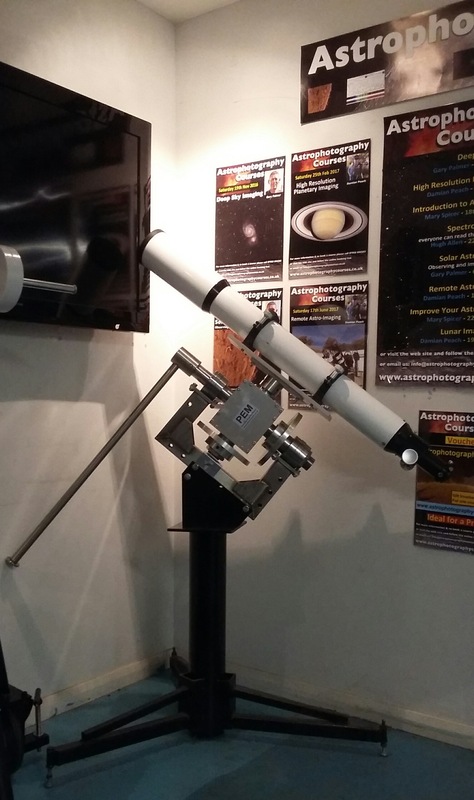 The Portable English Mount – is a high end telescope mount, it has can handle a payload way in excess of 50Kgs. The drive system is from AWR, it is the same (with different motors) as used in the Royal Observatory Greenwich (28inch), Herstmonceux Space Science Centre (all the large working telescopes), Perkins Observatory Telescope (OHIO State University) amongst hundreds of others worldwide. 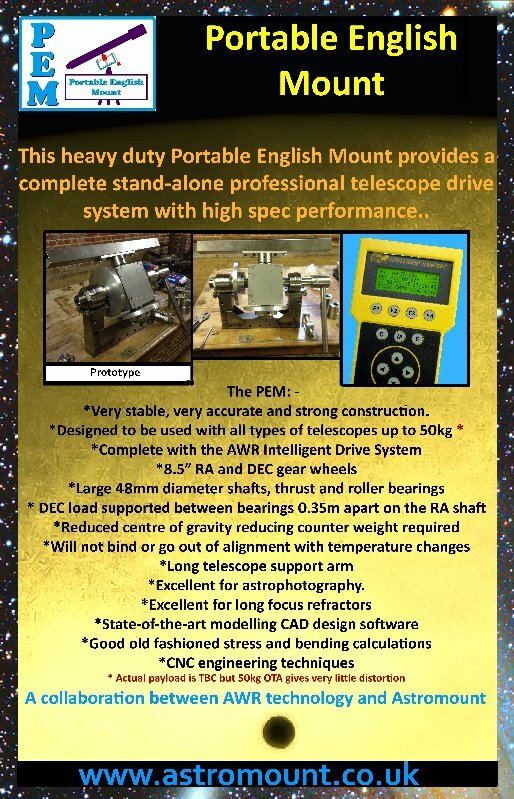 AWR Technology and Astromount – two UK Astronomy based manufacturing companies, both known for their design and innovation, have come together to tackle this problem, with machining being done by Robert ‘Skip’ Donaldson of RKD Machine Shop Services. Our prototype is being launched at the European Astrofest 10th and 11th February 2017. Download further details or our Portable English Mount poster. Alan Buckman of AWR Technology has written a document – The Woes of the Telescope Mount – discussing current mounts and their shortcomings. 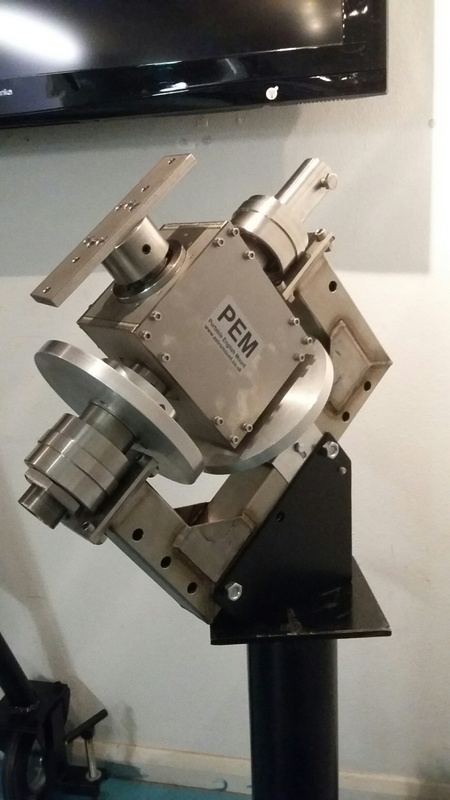 Our working price for the PEM comes in at £6500 + VAT. 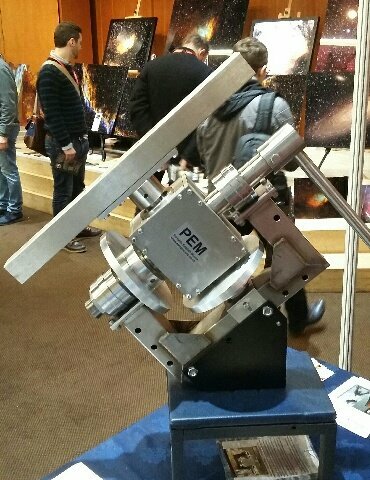 This is a high end mount with a payload way in excess of 50kgs. It has 8.5″ worm wheels and the pointing and tracking accuracy of the Paramount. Due to the English Mount design, holding the Dec axle between the RA bearings, it is very stable. It is fully goto and comes with the AWR drive system, which is used at the Royal Observatory (with different motors). There is an option of adding encoders for £1500 + vat. Also we are working out an option for phosphor bronze worm wheels which is not yet confirmed. It can also be supplied without goto.